University of Central Arkansas President Houston Davis, Associate Vice President for International Engagement Phillip Bailey and Study Abroad and Exchange Program Manager Natalie Flemming visited partner university Instituto Tecnológico y de Estudios Superiores de Occidente (ITESO), Universidad Jesuita de Guadalajara in Mexico as part of ITESO’s International Partnership Week, February 18-21. 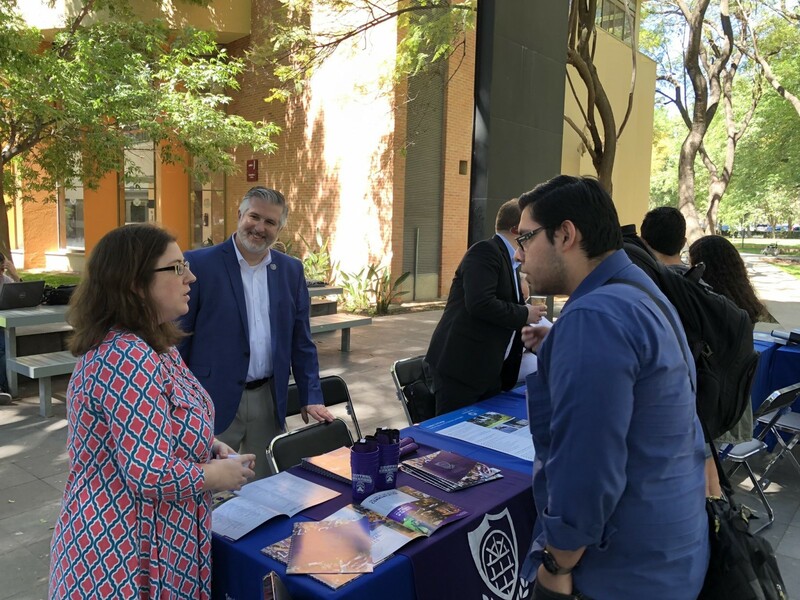 The visit allowed UCA to strengthen its relationship with ITESO through identifying collaboration opportunities and recruiting future students to spend a summer or semester at UCA. President Davis met with ITESO’s rector, Dr. Luis Arriaga, to discuss the two universities’ ongoing collaboration and partnership. UCA’s partnership with ITESO has also opened the door for short-term faculty exchange opportunities. Dr. Riva Brown, assistant professor of Public Relations, will co-teach a course in summer 2019 in ITESO’s International Summer program, which brings faculty from around the world to Guadalajara each summer to teach courses in English with ITESO faculty. Brown is the second UCA faculty member to teach at ITESO. The international partnership was established in July 2017 and has included the exchange of students through summer and semester programs. In summer 2018, seven UCA biology students and one professor traveled to ITESO to study environmental science and Spanish for a month. UCA received seven students from ITESO to take courses in UCA’s Intensive English Program while learning about American culture. UCA and ITESO received the “100,000 Strong in the Americas” Metlife Foundation grant in the amount of $25,000 in October 2017, supporting the first exchange of students in summer 2018. A second group funded by the grant will return to UCA in June 2019 to study in the Intensive English Program. Five students from both universities have already taken advantage of the semester exchange tuition waiver. ITESO is one of UCA’s 21 international partner universities across five continents that offer study abroad opportunities to students. The UCA Office of Study Abroad strives to provide students with life-changing experiences through academic programs across the globe. With a commitment to international education, the Office of Study Abroad is one component of International Engagement at the University of Central Arkansas. Students can earn credit through our semester exchange, language immersion and faculty-led opportunities. Learn more about UCA Study Abroad at uca.edu/studyabroad. For more information, contact Flemming at (501) 450-3387 or natalief@uca.edu.